Haven’t blogged for some time as the last few months I have been very busy with lots of commissions ranging from carved mouldings, furniture carving, restoration and conservation work and incised lettering. 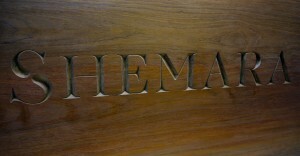 Here’s a photo of some incised lettering that I have recently completed for a Yacht company. More photos are available in my website of new work that I have just finished. Happy Christmas and a prosperous New Year to all of my clients and followers.